What's Gillard doing? Read on. Yes, inherent in this headline is a bold claim. However, given the snoringly-dull progression of the election so far, it hardly could be considered an outrageous one. About the only colourful aspect, so far, has been the language our leading candidates have elicited from the Fourth Estate: The axe-wielding ‘ranga’ versus the budgie-smuggling mad monk. And even these don’t compare in subtlety and nuance with jibes of our political past. For example, Sir George Houstoun Reid, Australian Prime Minister in 1904 and 1905, after a backflip on the issue of Federation, was nicknamed… wait for it… “Yes-No Reid”! Okay, perhaps subtlety and nuance have never been a strength of Australian political dialogue. With nothing much ado on the frontlines, it seems that the only option left for those in the commentary box is to… well… comment on the commentators. Fortunately, in the age of digital media, analysis has never been more interesting. While our political candidates might not have adopted Obama’s 2008 campaign’s playbook or embraced Twitter to the extent seen in other national elections, the role and influence of social media can no longer be denied. It was, therefore, only a matter of time before one of the media monitoring services launched a tool to analyse the election on the social web. 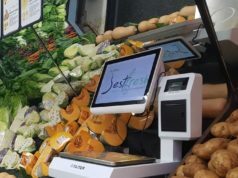 First, or at least most proactive, has been BuzzNumbers, which describes itself as “Australia’s leading provider of social media intelligence and monitoring services”. The site delivers a comprehensive overview of election coverage across online forums, social media sites, and twitter, offering a breakdown of coverage by topics, city, state-by-state analysis, and the Top 100 Influential Tweeters. It’s actually kind of impressive, identifying the top most influential Twitterers (Would you believe that @SunriseOn7 ranks at number three?) and the trending topics. Among the top issues discussed are Climate Change and Immigration (Climate Change is well in the lead as a hot topic). 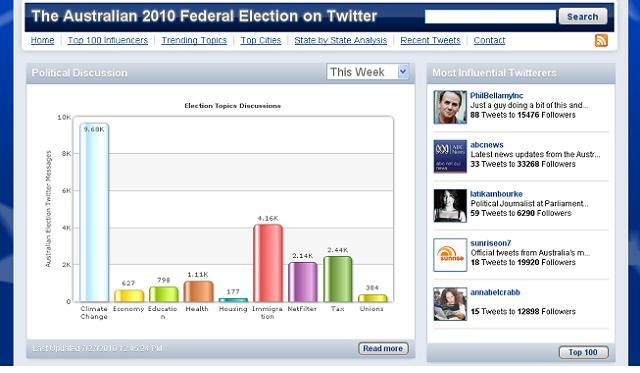 The most active tweeters located in Sydney and Canberra. Click here to see which topics are trending right now. Vibewire is a non-profit youth organisation providing media, arts and entrepreneurial opportunities and events for young people. And YouTube is the world’s most popular online video community (in case you didn’t know). 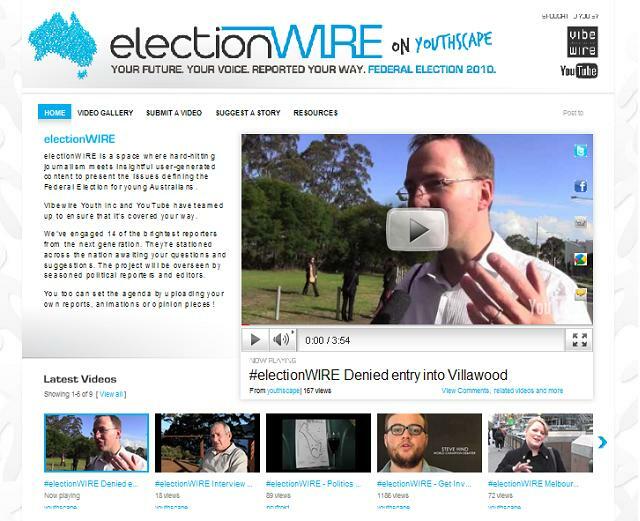 Unlike most ‘build it and they will come’ social media campaigns, electionWIRE features video news, interviews, opinions and debate from “a team of recruited and trained Vibewire Youthscape reporters”. Their video reports are supported by citizen contributors from the YouTube community. The new recruits are stationed across Australia, armed with cameras, guided by questions and ideas posted to the electionWIRE YouTube channel, and supported by a senior editorial team. The community can submit and vote on videos, suggestions and ideas that interest them most via the Google Moderator tool on the channel. Whether they’re talking about youth unemployment, immigration, the ETS, homelessness or health, electionWIRE reporters will be asking the hard questions and getting unpredictable answers. 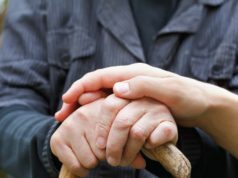 It was once said that a letter to a politician represents the views of a thousand voters. I’m not sure how a video might rate but it’s especially pleasing to see one organisation embracing channels likely to be more familiar to this emerging set of influences, who are unlikely to write letters (and even less likely to call talk back radio) but might just video their views. Many Australians will have heard of MoveOn.org, the US non-profit lobby outfit that has raised millions of dollars to run advertising to support US candidates it identifies as “moderates” or “progressives”. Inspired by MoveOn.org, GetUp.org was founded in 2005 to help voters to “keep the Howard Government accountable” after it won a majority of seats in the Australian Senate. The organisation operates by raising money, through pledges, so that it might, therefore, place ‘crowd-funded’ advertising. So far, the campaign to fund this particular advertisement has raised over $125,000 in small $30, $50 and $100 increments. And if the views and, therefore, passions of the great-digital-unwashed are anything to go by, the most memorable aspect of this election will be the affairs that made it possible… namely the back-room dismissal of former PM Kevin Rudd. And while the campaign might be dull, we can always rely on the resourcefulness and boundless creativity of the world-wide-web, coupled with the now iconic Hitler Finds Out meme (until the copyright owners of Downfall exercise a take down notice). The creators of this hilarious video disabled the embedding option. So, you’ll have to follow the link to watch the clip: Hitler Downfall – Kevin Rudd Video (NB. Salty Language Warning: High). So, what next for the election? If you, dear readers, can think of any other ways to make the election more interesting or know of another organisation that already is, leave a comment below. Please! Previous articleToo busy to read the papers? Press play to listen instead.